A while back I had some dialogue with Jason a beekeeper that operates about 45 minutes to the South of me. I have been talking bees with him for several years now over the internet though we never really have met in person. He is a member of a Bee Club that I have attended in the past Southeastern Indiana Beekeepers Association. He notified me of a swarm trapper who had pointed out a flaw with the 5 frame traps I had available for a while on this site. Picture of larger volume trap. He stated that he felt they were too small, and actually he is probably right. Now I know that some have already built these things and that’s OK. They can still catch swarms, but they probably aren’t giving you the best opportunity to select for larger colonies of bees. If you have them already don’t fret. They can still be an asset in your beekeeping operation. More on that in a minute. In response to this I have spoken to my CAD Guy (a.k.a. Jeff) and eventually the goal is to make up some new trap plans that will still make an attempt at efficient utilization of a 4 x 8 sheet of plywood as well as give you the best opportunity possible selecting for larger swarms that will translate into more robust productive colonies. In the mean time for anyone still thinking about building traps this season, take a look at this design. There are no plans yet, but at least it will give you something to go off of. Cross section of larger volume trap. The plans that were previously posted will eventually be relabeled as Nuc boxes. I think they are an efficient utilization of of plywood to make 4 nuc boxes on the cheap. If you already built them keep them around. 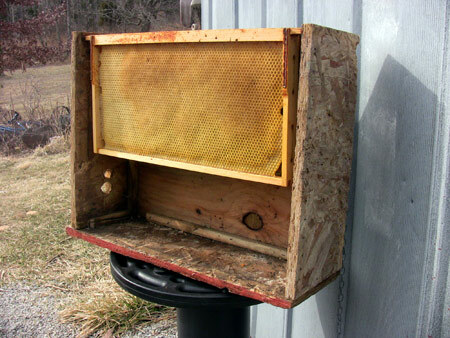 Nuc boxes are handy things to have when you are keeping bees. For the RECORD I still think that using old deep boxes is the best option for building hanging swarm traps. If you have the chance to acquire them do so. Then take a look at Swarm Trap Plans. Remember to be checking Please Post your Swarm Dates on BeeSource.com to determine if swarming activity is approaching your area. Once you subscribe to that thread you will get e-mail updates. You can actually watch the swarm progression approaching you from the South. Good luck and get ready! I look for swarms to begin emerging around here the next time we see a string of days approaching 80 degrees F.
The pictures in this post were shamelessly stolen from a post on the Southeastern Indiana Beekeepers Association site from this page. I do not claim them to be my own work. Big thanks to Jason M for bringing all of this to my attention. 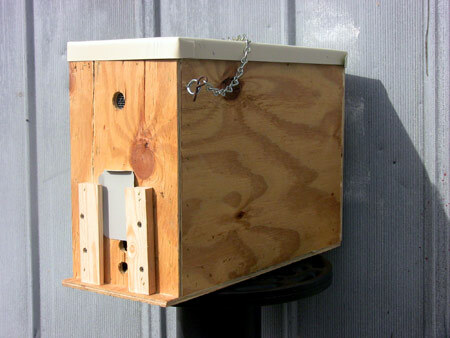 This entry was posted in Feral Bees, Genetics, HowTo, Swarm Trapping and tagged bait hive, Indiana Beekeeping, Southeastern Indiana Beekeepers Association, swarm trap. Bookmark the permalink.